Posted on March 6, 2012 by Brandrenaline, Inc.
No matter how much NASCAR’s fan base has declined, I was reminded recently that they still have a massive audience. And yes, this is true. Whether it be a sports property, reality TV show or sitcom, most would be thrilled to have the large, loyal following that NASCAR still has. Having said that, I still see reason for concern. The first issue is simple. The audience is declining. This is a fact. The second issue is also simple. The cost to participate is not declining. This is also a fact. Let me address audience first. Growth and decline in audience are impacted by momentum. By attending a race, and/or watching on TV, fans get to join the conversation. The activity is validated by how many people are in the conversation, and you get this word-of-mouth growth. This used to (and did) takes years. The conversations are sprinkled with questions like “Did you see….? Did you hear what (driver) did?” And when asked, you better have an answer and an opinion. So, the sport grows in popularity. As soon as the conversation starts to contain language like; “I don’t care anymore”, or “No, I didn’t watch that race”, or “I’m not going this year”, or “I can’t afford it”… the audience declines with steady, negative momentum. Combine this with our new ability to communicate in real time, to likeminded people, all over the country(s), and you can see that momentum can and will shift faster than ever before, thanks to Facebook, Twitter, et al…. So, audience is declining, but it is still a large audience. My other concern is on the cost side of the equation. To put it in the simplest terms; the audience that Sprint will pay to reach today, is not the audience they bought. They paid for a larger audience. There are/were a lot of very clever people behind the language in those contracts – on both sides – so there might be clauses that increase the rights fee payable to NASCAR if certain audience metrics are exceeded. There may also be clauses that reduce the rights fees if there are declines in audience. If these clauses exist, NASCAR is getting lower rights fees, and that is not good. If these clauses do not exist, then Sprint is getting less value and that is not good. And of course, where I used the word “Sprint” above, you could insert any team, series, or event sponsor. They are all getting less than they paid for. TV rights fees are returned to the broadcast partners by selling advertising. Tough to make a profit – which they are entitled to do – with “less” audience. The costs required to operate a race team, a race track, a licensed merchandise trailer or a hot dog stand have not declined. But their available market has. On the race team side, in 2011, Roger Penske will end his 18-year sponsorship (partnership, loyalty, friendship) with Mobil1 and will move to Shell. Penske did this because he will get more ‘benefits’ (cash, in-kind, pass-through, technology, plus…). Okay, makes sense, but why would Shell move from Childress and Kevin Harvick – the team and driver that almost won the Championship? The answer is simple: audience. Penske brings an additional relevant, measurable ‘audience’. What the Captain has that Richard does not, is over 300 car dealerships that consume a massive amount of lubricants. With an overall decline in ‘audience’, Shell needed to find other ways to get measurable return on investment. So, there are two strategies at play here. One is cost-cutting, and you can see that everyone is trying to do that. To me, they should first and foremost cut the schedule. I could dedicate pages to the benefit of doing this. To over-simplify, let’s squeeze today’s audience into a schedule that will fill the seats at the track, and will re-energize TV numbers. 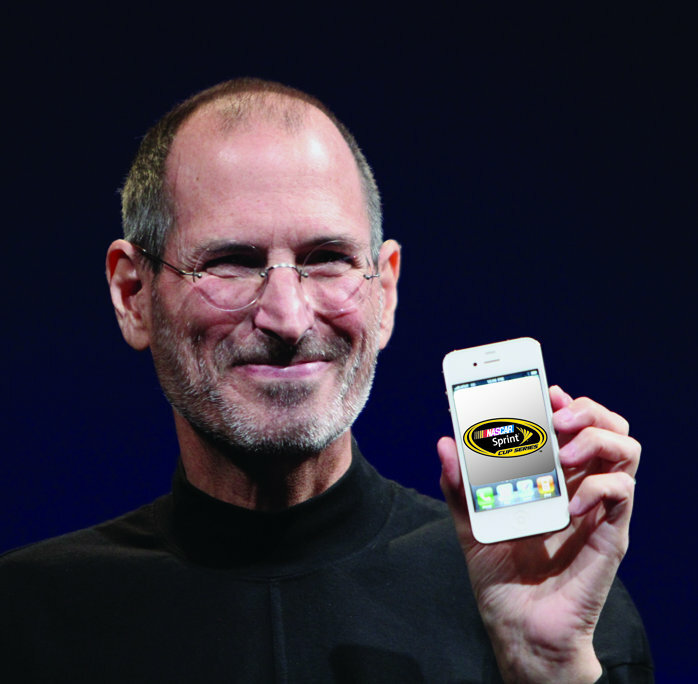 So, if Steve Jobs was running NASCAR, he would declare that “the product is crap”, and that we need to “reinvent the customer experience with our brand!” Can you hear him saying that? I can. He’d use technology – at the highest level – to completely change the way fans consume the content. But he would not market the ‘technology’. He’d market the experience… the engagement. He’d make it cool to be a NASCAR fan. You would not just watch a NASCAR race on TV. You’d consume the content in a simple, user-friendly, meaningful-to-you, kinda way. At the track, it’d be same, only cooler. Steve would also re-write the rule books and change the org charts of the teams. Technology would be encouraged that allows the fan to have a deeper understanding of the sport. This is key. The fan does not need to know how they got the content. They just need ‘content’ to deepen their relationship with the sport. When Steve rolls out the new iWhatever, his pitch always goes straight to the customer experience. This is what he’d do with NASCAR. And let’s be clear on technology. Formula1 owns “technology” in the mind of the consumer. That is not what we are talking about here. We are talking about the use of the highest technology for the benefit of the audience. Formula1’s use of technology is for braking, cornering, and accelerating… they can have that positioning. As far as the org chart goes, they’d still interview Chad Knaus during the race, but they would also interview the team’s CEO – the “Customer Engagement Officer”. This person would manage how and where fans can consume their team’s content, in real time and on what devices. The good teams will build measurable audience by focusing on this deep engagement, and then learn to monetize it. NASCAR will want to do this as well, but the good teams will beat them to it. Next, Steve would fire everyone associated with the television programming. No more Kenny Wallace…. Sorry! He’s just not cool enough. Steve would fix the TV product. If I knew how, then I’d be running Apple. I just know it’s broken – and that he’d fix it. It is the only TV that I watch that literally puts me to sleep. My family thinks it’s hilarious. Steve Jobs would use technology that would allow fans to relate to the talent of the athletes. But he’d market the access and content, not the chips and ram and whatever else is in his box. I think that “Have at it boys” was a necessary step – on the track. I also think that Brian France needs to gather up his management team and offer them the same directive – “Have at it team!” – It’s time to make decisions for our brand with the belief that Steve Jobs will be presenting the ‘new’ NASCAR in a Keynote presentation. It better be new and beyond cutting edge, and it better be cool…. And, it better be now.